I'm proud to announce the launch of the Port Cafe, a community cafe based out of the Port / Area IV neighborhood of Cambridge where I live. With a team of 4 other folks, we are off the ground! I wrote about Stone Soup Greenfield in a previous post. The Port Cafe is largely inspired by that cafe and is proud to join Stone Soup as part of Unity Tables, a national network of pay-what-you-can community cafes. We had our first Port Cafe dinner in July and our next one is Thursday, August 28th. If you are in the area, we hope you'll join us! Read below for details and to RSVP. Please visit the Port Cafe website to learn more and join our mailing list! 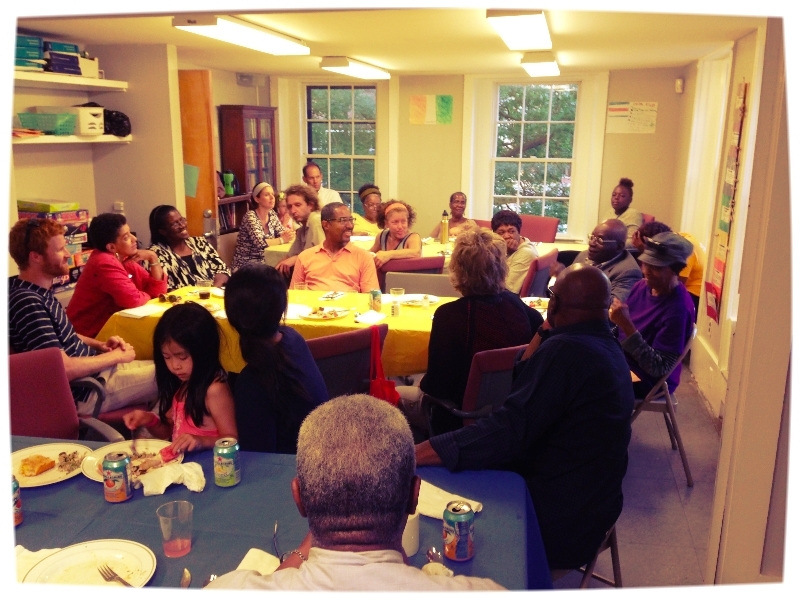 Join us for our second Port Cafe potluck dinner on Thursday, August 28th! The Port Cafe creates community-minded spaces in which neighbors from the Port/Area IV neighborhood can come to feed the body, mind, and soul in a safe and welcoming environment. Join us for our second Port Cafe potluck dinner! Thursday, August 28th from 6:00-8:00PM at the Pisani Center (131 Washington Street, between Windsor St. and Cardinal Medeiros Ave). Click here to invite a neighbor! And in the meantime, check out our new website. Click here for the story of the Port Cafe! We want to respect your privacy while publicizing the Port Cafe. If you do NOT wish to be included in photos related to the Port Cafe, please send an email with the subject "Please do not use my picture." First, take six minutes to watch James Baldwin and Toni Morrison (separately) discuss what racism reveals about White America. These clips reveal a truth I've seen as a White American: often, we think of racism as a problem for brown-skinned people. White Americans like me can go through our lives remaining oblivious to the ways in which racism is OUR problem, and how it wounds White people in ways that mainstream society encourages us to ignore. This brings me to White schizophrenia, a topic on which people like Baldwin and Morrison are experts. Here's what I've seen: if you grow up in America with societal label of "White," you grow up with a system of self-understandings that are fundamentally contradictory. On the one hand, as people labeled White, we are taught by mainstream society, over the course of a million little moments, that White people are superior. I only have to look at the books I was assigned in school (almost all White authors), or who starred in the movies I watched growing up (White people), or who controlled the news I watched or read (White people). Scratching the surface of what's most painful of all for me, I think about who myself and other White people marginalized and looked upon as an exotic, dangerous species during my public school experience (Black students). Not only are we taught that White people are superior, but we are also taught that it is good and right that White people are on top, socio-economically. We are taught that White people are smarter, more civilized, more morally-sound, and more well-intentioned than other people. On the other side of this understanding of self, White people must, over the course of our growing up, experience the truth, which is that that concept of White supremacy is laughable. When we can resist relying on stereotypes and instead observe individuals, we see that intelligence and moral character have no correlation with race, and everything to do with context. We see that people who are consistently wounded are more likely to act badly towards others, themselves, and their environment--regardless of their race. We see that people who are loved and accepted--again, regardless of their race--become people who love and accept others and work to preserve their environment. Even a White person who grows up with little or no contact with people of color experiences both the depth of awfulness and the height of beauty that other White people are capable of. If you have grown up seeing and participating in the moral vacuum that some White people are capable of living in, you cannot reasonably accept the idea of White supremacy, applied as a blanket belief to all White people. What does this realization of a conflicted identity do to the White psyche? What happens when we are taught, by people we respect and love, to believe a lesson so deeply it becomes instinct, and yet our own experience (which is just as powerful as any teacher) proves that belief to be false? And worse, what if this lesson of superiority (now proved false) has formed a basis for the White person's self-image since their early childhood? If I have been taught, day in and day out, that I am inherently superior because I'm White, how do I process my accumulated life experiences that quietly punch gigantic holes all throughout this idea? If it's not true that I'm superior in my Whiteness, then what is true about me? Anti-racism begins with internal work by White people. In addition to the moral call for eliminating racism, we White people must see that anti-racist work is also about healing our own wounds (which are often invisible to White eyes), wounds that are inflicted when our learned ideas of White supremacy and the reality of our day-to-day experiences with all-too-human, flawed, and sometimes morally-bankrupt White people collide.